Our value for money toilet rolls are specifically made to help them be strong but soft. This Hospec Toilet Cleaner is an easy to use product that kills germs and freshens at the same time. This product is ideal for use in a range of properties including schools, hotels, nursing homes, offices and homes. It is available to buy as a single product or as a bulk buy option. Toilet freshner rim block contained in a cage. This Apple Toilet Cleaner from the Janitorial Direct brand provides a fast and effective clean on a range of toilet surfaces. It is suitable for use on porcelain, stainless steel, plastic, enamel, and chrome. It offers a powerful clean making it ideal for use in commercial, business and domestic properties. It is available to buy online and can be bought as part of a bulk buy option. 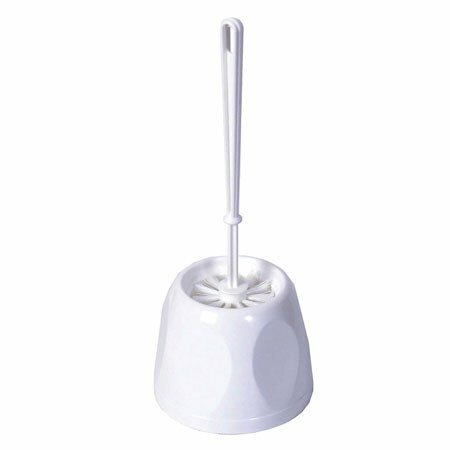 Economy toilet brush and holder in white plastic. 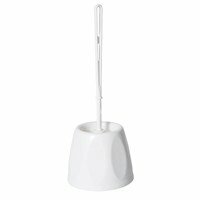 This toilet brush is ideal for cleaning the toilet bowl and features a matching freestanding plastic holder ensuring hygienic storage after using the brush.